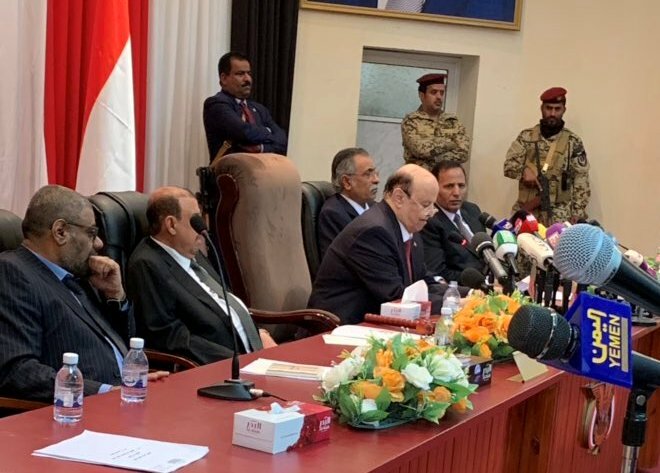 Yemeni parliament meeting in Seyoun clearly indicates that all Yemenis have unified on the basis of legitimacy and national principles against the Houthi devastative project, said President Abd Rabbu Mansour Hadi at Saturday preliminary parliamentary session. The Houthi project "corrodes day after day, their racism has isolated them from all the people and currents, and they no longer have anyone except those under duress," he added. "Today Yemenis restore an important institution of their state," Hadi said calling on all other MPs to join the Parliament. 145 members of the Yemeni Parliament held Saturday in Seyoun the first session under legitimacy since war started in March 2015, amid tightened security measures. The lawmakers unanimously elected Sultan al-Barakani as speaker and Abdul Aziz Jubari, Mohamed al-Shadadi and Muhsin Basera as deputies. On Wednesday, President Hadi called for the session in the eastern governorate of Hadhramout under Yemeni law allowing for the president to locate any area inside the country, when it is insecure, to hold parliamentary session. This is the first session held out of the Houthi-held capital Sana'a since the conflict raged between the internationally-recognized Saudi-backed government and the Iranian-backed rebels, who still control most populated provinces in northern Yemen. At the session, Hadi called on Houthi group to stop violence after "four years of destruction and killings .. as a result of your whims and Iran's greed. Our country is yours, you're Yemenis, so don't make the nation's presence and future dependent on the enemies." "We have stretched our hands to you, and we do the same today for the sake of peace and Yemen," the president appealed to Houthis, who he said had chosen to be enemies to Yemeni people, had only fired their guns at Yemenis and had only targeted their institutions. Yemeni legitimate government aims to reach inclusive peace based on three references, Hadi claimed, but "Houthis hinder those efforts .. have rejected all calls for dialogue and peace, and deliberately thwart every attempt for peaceful solution." The president appealed to Yemenis to cling to the hope that the coup would be defeated, state institutes would be rebuilt to serve all citizens and life would be fully renormalized. The newly-elected speaker said Iran seeks, through Houthi project, to establish its influence from Yemen to Lebanon. But "we are determined to defeat the coup in order for the people to restore their state," Barakani added calling the rebels to enter in peace as a political entity under law, National Dialogue outputs and UNSC resolutions. While the Parliament was convening in Seyoun, Houthis announced in Sana'a the commencement of by-election to fill in vacant seats in areas under their control. "Voters in 24 constituencies including 453 electoral centers on Saturday headed for ballot boxes in Sana'a City and nine governorates," the Sana'a-based Saba reported.